This is one of two common methods of dewatering based upon thermaal energy. Drying beds are generally used for dewatering of well digested sludges. Attempts to air dry raw sludge usually result in odor problems. Sludge drying beds consist of perforated or open joint drainage pipe laid within a gravel base. The gravel is covered with a layer of sand. Partitions around and between the drying beds are generally open to the weather but may be covered with ventilated green-house type enclosures where it is necessary to dewater sludge in wet climates. The drying of sludge on sand beds is accomplished by allowing water to drain from the sludge mass through the supporting sand to the drainage piping and natural evaporation to the air. As the sludge dries, cracks develop in the surface allowing evaporation to occur from the lower layers which accelerates the drying process. There are many design variations used for sludge drying beds, including the layout of the drainage piping, thickness and type of materials in the gravel and sand layers, and construction materials used for the partitions. The major variation is whether or not the beds are covered. Any covering structure must be well ventilated. In the past, some beds were constructed with flat concrete bottoms for drainage without pipes, but this construction has not been very satisfactory. Asphalt concrete (blacktop) has been used in some drying beds. The only sidestream is the drainage water. This water is normally returned to the raw sewage flow to the plant or to the plant headworks. The drainage water is not normally treated prior to return to the plant. Experience is the best guide in determining the depth of sludge to be applied, however, typical application depth is 8 to 12 inches. The condition and moisture content of the sludge, the sand bed area available, and the need to draw sludge from digesters are factors to consider. It is not advisable to apply fresh sludge on top of dried sludge in a bed. The best time to remove dried sludge from drying beds depends on a number of factors, such as subsequent treatment by grinding or shredding, the availability of drying bed area for application of current sludge production, labor availability, and, of course, the desired moisture content of the dried sludge. Sludge can be removed by shovel or forks at a moisture content of 60 percent, but if it is allowed to dry to 40 percent moisture, it will weigh only half as much and is still easy to handle. If the sludge gets too dry (10 to 20 percent moisture) it will be dusty and will be difficult to remove because it will crumble as it is removed. Many operators of smaller treatment plants use wheelbarrows to haul sludge from drying beds. Planks are often laid on the bed for a runway so that the wheelbarrow tire does not sink into the sand. Wheelbarrows can be kept close to the worker so that the shoveling distance is not great. Most plants use pick-up trucks or dump trucks to transport the sludge from the drying bed. Dump trucks have the advantage of quick unloading. Where trucks are used, it is best to install concrete treadways in the sludge drying bed wide enough to carry the dual wheels since the drying bed can be damaged if the trucks are driven directly on the sand. The treadways should be installed so that good access is provided to all parts of the beds. If permanent treadways have not been installed, heavy planks may be placed on the sand. Large plants will normally utilize mechanical equipment for handling the dried sludge. Some communities have encouraged public usage of the dried sludge. In some cases users are allowed to remove the sludge from the beds, but this may not be satisfactory in many cases. Local regulations should be reviewed before attempting to establish a public utilization program. This is a technique that relies both on the settling characteristics of sludge and solar evaporation. The considerable labor involved in sludge drying bed operation may be avoided by the use of sludge lagoons. These lagoons are nothing but excavated areas in which digested sludge is allowed to drain and dry over a period of months or even a year or more (refer to Figure 22 for an example). They are usually dug out by bulldozers, or other dirt-moving equipment, with the excavated material used for building up the sides to confine the sludge. Depths may range from two to six feet. Areas vary, and although drainage is desirable, it is not usually provided. Digested sludge is drawn as frequently as needed, with successive drawings on top of the previous ones until the lagoon is filled. A second lagoon may then be operated while the filled one is drying. After the sludge has dried enough to be moved, a bulldozer, or a tractor with an end-loader, may be used to scoop out the sludge. In some locations it may be pushed from the lagoon by dozers into low ground for fill. Lagoons may be used for regular drying of sludge, re-used after emptying, or allowed to fill and dry, then leveled and developed into lawn. They can also be used as emergency storage when the sludge beds are full or when the digester must be emptied for repair. In the latter case it should be treated with some odor control chemicals, such as hydrated or chlorinated lime. The size of the lagoon depends upon the use to which it will be put. Lagoons may take the place of sludge beds or provide a place for emergency drawings of sludge, but they may be unsightly and even unwanted on a small plant site. However, they are becoming more popular because they are inexpensive to build and operate. Although lagoons are simple to construct and operate, there can be problems associated with sizing them. These problems largely arise from uncertainty in estimating the solar evaporative capacity. In semi-arid regions evaporation ponds are a conventional means of disposing of wastewater without contamination of ground or surface waters. Evaporation ponds as defined herein will refer to lined retention facilities. Successful use of evaporation for wastewater disposal requires that evaporation equal or exceed the total water input to the system, including precipitation. The net evaporation may be defined as the difference between the evaporation and precipitation during any time period. Evaporation rates are to a great extent dependent upon the characteristics of the water body. Evaporation from small shallow ponds is usually considered to be quite different than that of large lakes mainly due to differences in the rates of heating and cooling of the water bodies because of size and depth differences. Additionally, in semi-arid regions, hot dry air moving from a land surface over a water body will result in higher evaporation rates for smaller water bodies. The evaporation rate of a solution will decrease as the solids and chemical composition increase. Depending upon its origin, evaporation pond influent may contain contaminates of various amounts and composition. Decreases in evaporation rates compared to fresh water rates can seriously increase the failure potential of ponds designed on fresh water evaporation criteria. Designers of settling ponds and lagoons that rely on evaporation need to know the probability level of their designs being exceeded. Confidence limits for published evaporation normals have not been given, nor have analyses been made of the effects of uncertainty in the estimated normals or of the temporal variation of net evaporation. Definition of the spatial and temporal distribution of parameters such as evaporation and precipitation is difficult in mountainous regions. A concern is that the application of many of the empirical equations, based on climatological data, for estimating evaporation have not been thoroughly tested for high altitude conditions. In particular, the ability of these equations for defining the variability of evaporation basically is unknown. 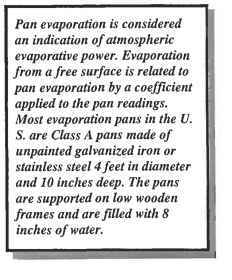 Historically, pan data is the most common means for defining free water evaporation. However, the density of evaporation pan stations is much less than that of weather stations. Many methods exist for either measuring or estimating evaporative losses from free water surfaces. Evaporation pans provide one of the simplest, inexpensive, and most widely used methods of estimating evaporative losses. Long-term pan records are available, providing a potential source of data for developing probabilities of net evaporation. The use of pan data involves the application of a coefficient to measured pan readings to estimate evaporation from a larger water body. Among the most useful methods for estimating evaporation from free water surfaces are the methods which use climatological data. Many of these equations exist, most being based directly upon the a method which was originally intended for open water surfaces, but is now commonly applied to estimates of vegetative, water use. Where f(u) is a wind function and (es - ed) is the vapor pressure deficit. where P is the atmospheric pressure in inches of mercury. My own experience in designing surface lagoons and evaporation ponds over the years, and substantiated in the literature, has been to apply a pan coefficient of 0.7. Of concern is that there is very little information often available concerning the effects of common waste waters on evaporation rates. As noted, the evaporation rate of a solution will decrease as the solids and chemical concentrations increase. However, the overall effects on evaporation rates of dissolved constituents as well as color changes and other factors of wastewater are largely unknown. Evaporation from surface ponds are usually based upon estimates of annual net evaporation. Calculation of annual evaporation rates requires estimates during periods when the surface may be frozen. Most studies related to cold weather evaporation have been concerned with snow rather than ice. In general, the evaporation from a snow pack is usually much less than the amount of melting that occurs. Considering the large percentage of the annual evaporation which occurs during the wanner months and the overall uncertainties involved in estimates of evaporation from water surfaces, the amount of evaporation from frozen ponds during winter can reasonably be neglected in calculating annual evaporation. A more important consideration is the evaporation which occurs during winter from ponds which may remain unfrozen due to the introduction of warm wastewater. In these cases, water temperature will influence the evaporation rates. However, the low value of the saturation vapor pressure of the air above any water body will limit evaporation. Annual estimates of evaporation herein can be made by applying the Kohler-Nordenson-Fox equation throughout the year. Such estimates should provide near maximum possible evaporation estimates. For lined ponds, evaporation will be confined mainly to the water surface area. Evaporation from the soil and vegetation on the banks surrounding the pond should be minimal. However, for ponds which have appreciable seepage to the surrounding area, evaporation from this area will be dependent upon the type and amount of vegetation, as well as the moisture content of the upper soil layers. Methods foe estimating evaporation and/or évapotranspiration in these instances are readily available and you can find some of these studies and estimâïïng procedures by doing a Web search. If water losses from the surrounding area are a major component of the total evaporative losses of the pond, then soil moisture conditions will be expected to be high. Under non-limiting soil moisture conditions vegetative moisture losses are often defined as "potential" losses. Evaporative losses in this case would not be expected to differ greatly from free water evaporation. 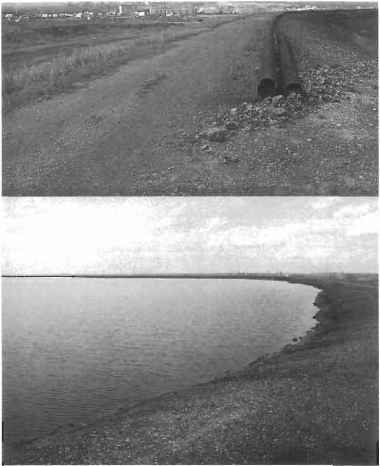 The literature recommends in fact that lake evaporation be used as a measure of potential évapotranspiration. Thus, for high soil moisture conditions, evaporation rates calculated for the water surface should be applicable to the surrounding area. The influence upon evaporation of vegetative growth within a pond is uncertain. The literature is inconclusive as to whether vegetation will increase or decrease evaporation compared to an open surface. It appears that the effect may be somewhat dependent upon the size of the water body. Literature studies indicate vegetation will decrease evaporation for extensive surfaces with the effect being less for smaller surface areas. It is very possible, however, that the introduction of vegetation upon the surface of a water body of more limited extent may increase its evaporative water loss, but only while the vegetation remains in a healthy, robust condition. Thus, the effect of the presence of vegetation appears to range from being a water conservation mechanism to that of increasing evaporation. In either case, the potential effects appear to be quite large with reported ratios of vegetative covered to open water evaporation under extreme conditions ranging from 0.38 to 4.5. In most instances, this ratio would be expected to be much closer to unity. As the title implies, we will now focus our attention to those technologies aimed at reducing the volume of the final form of the sludge. Dewatering or thickening technologies can only bring us so far in concentrating the form of the waste. Ultimately, we must find ways of either disposing of this waste, or in using it. We'll discuss applications later on. Of immediate concern is how we can reduce the volume of so-called "dry" sludge, at solids contents ranging anywhere from 30 to 60 %, even further. In all types of incinerators, the gases from combustion must be brought to and kept at a temperature of 1250° F to 1400° F. until they are completely burned. This is essential to prevent odor nuisance from stack discharge. It is also necessary to maintain effective removal of dust, fly ash and soot from the stack discharge. This may be done by a settling chamber, by a centrifugal separator, or by a Cottrell electrical precipitator. The selection depends on the degree of removal efficiency required for the plant location. All types of sludge, primary, secondary, raw or digested sludge, may be dried and burned. Raw primary sludge with about 70 percent volatile solids contains about 7800 Btu per pound of dry solids and when combustion is once started will burn without supplementary fuel, in fact an excess of heat is usually available. Digested sludge may or may not require supplementary fuel, depending on the moisture content of the cake and percent volatile solids or degree of digestion. Raw activated sludge generally requires supplementary fuel for drying and burning. In all cases, supplementary fuel is necessary to start operation and until combustion of the solids has been established. Incineration of sludge has gained popularity throughout the world, especially at large plants. It has the advantages of economy, freedom of odor, independence of weather and the great reduction in the volume and weight of end product to be disposed of. There is a minimum size of sewage treatment plant below which incineration is not economical. There must be enough sludge to necessitate reasonable use of costly equipment. One of the difficulties in operating an incinerator is variations in tonnage and moisture of sludge handled. There are two major incinerator technologies used in this process. They are (1) the multiple hearth incinerator, and (2) the fluidized bed incinerator. An incinerator is usually part of a sludge treatment system which includes sludge thickening, macerations, dewatering (such as vacuum filter, centrifuge, or filter press), an incinerator feed system, air pollution control devices, ash handling facilities and the related automatic controls. 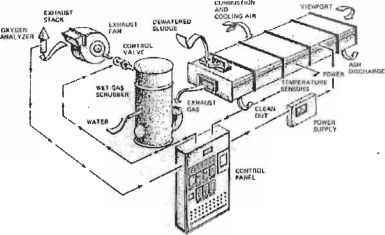 The operation of the incinerator cannot be isolated from these other system components. Of particular importance is the operation of the thickening and dewatering processes because the moisture content of the sludge is the primary variable affecting the incinerator fuel consumption. 5. produce a sterile residue or ash. There are four basic types of incinerators used in wastewater treatment plants. They are the multiple hearth incinerator, the fluid bed incinerator , the electric furnace , and the cyclonic furnace. Each system has it's own distinct method of incineration and while one may be more cost efficient, another may have more of an environmental impact. The basic configuration and features of the multiple hearth incinerator are illustrated in Figure 23. This incinerator is the most prevalent incinerator technology for the disposal of sewage sludge in the U.S. due to it's low ash discharge. Sludge cake enters the furnace at the top. The interior of the furnace is composed of a series of circular refractory hearths, which are stacked one on top of the other. There are typically five to nine hearths in a furnace. 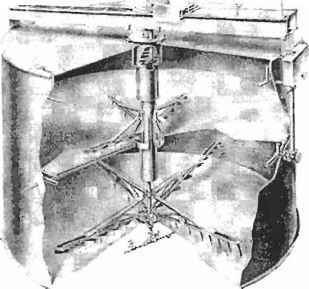 A vertical shaft, positioned in the center of the furnace has rabble arms with teeth attached to them in order to move the sludge through the mechanism. Each arm is above a layer of hearth. Teeth on each hearth agitate the sludge, exposing new surfaces of the sludge to the gas flow within the furnace. As sludge falls from one hearth to another, it again has new surfaces exposed to the hot gas. At the top of the incinerator there is an exit for flue gas, an end product of sludge incineration. At the bottom of the furnace there is an exit for the ashes. The basic configuration and features of the fluid bed incinerator are illustrated in Figure 24. This technology has been around since the early 1960s. In this system, air is introduced at the fluidizing air inlet at pressures of 3.5 to 5 psig. The air passes through openings in the grid supporting the sand and creates fluidization of the sand bed. Sludge cake is introduced into the bed. The fluidizing air flow must be carefully controlled to prevent the sludge from floating on top of the bed. Fluidization provides maximum contact of air with sludge surface for optimum burning. The drying process is practically instantaneous. Moisture flashes into steam upon entering the hot bed. Some advantages of this system are that the sand bed acts as a heat sink so that after shutdown there is minimal heat loss. With this heat containment, the system will allow startup after a weekend shutdown with need for only one or two hours of heating. The sand bed should be at least 1200° F when operating. Figure 25. Radiant heat (electric) incineration scheme. 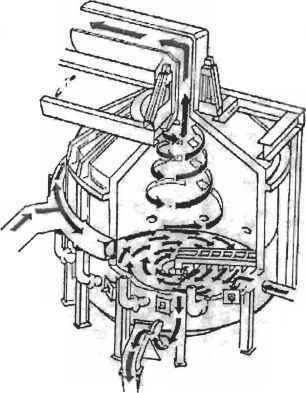 The basic features of the electric furnace are illustrated in Figure 25. The electric furnace is basically a conveyor belt system passing through a long rectangular refractory lined chamber. Heat is provided by electric infrared heating elements within the furnace. Cooling air prevents local hot spots in the immediate vicinity of the heaters and is used as secondary combustion air within the furnace. The conveyer belt is made of continuous woven wire mesh chosen of steel alloy that will withstand the 1300 to 1500° F temperatures. The sludge on the belt is immediately leveled to one inch. The belt speed is designed to provide burnout of the sludge without agitation. The basic features of the cyclone furnace are illustrated in Figure 26. The cyclonic furnace is a single hearth unit where the hearth moves and the rabble teeth are stationary. Sludge is moved towards the center of the hearth where it's discharged as ash. The furnace is a refractory lined cylindrical shell with a domed top. The air, heated with the immediate introduction of supplemental fuel creates a violent swirling pattern which provides good mixing of air and sludge feed. The air, which later turns into flue gas, swirls up vertically in cyclonic flow through the discharge flue in the center of the doomed roof. One advantage of these furnaces is that they are relatively small and can be placed in operation, at operating temperature within an hour. A good question for us to ask at this stage is what does a sludge treatment plant do with the ash that is discharged out of the furnace? As ash falls into a wet sump, turbulence is created by the entrance of water. This turbulence is necessary so that the ash doesn't collect and cake up. This water containing the ash is pumped into a holding pond or lagoon, with a residence time of at least 6 hours. During this time, 95% of the ash will have settled to the bottom and the overflow is taken back to the treatment plant. There has to be a minimum of two lagoons with one being used to hold the ash-water discharge and the other for drying. When dry, the ash is hauled to a landfill or used for concrete. Mixing one part of ash to four parts cement will produce a slow-setting concrete with no loss in strength. A serious environmental impact that incineration has is on the air. An incinerator's smoke discharge or flue gas should be colorless. Flue gas is an emission mainly made up of nitrogen, carbon dioxide and oxygen. There are traces of chloride and sulfides in the gas and if these levels become to high, they could cause the possibility of corrosion. With respect to the color of the discharge again, if there is a significant amount of particulate matter in the emission, it will be detected by color. The stream can range from a black to white appearance and will have a pale yellow to dark brown trail. The discharge should also have no discernable odor and there should be no detectable noise due to incinerator operation at the property line. Unfortunately colored emissions and odor problems do occur and treatment plants take the proper actions to correct it. Air pollution controls are critical factors that add significant costs onto these technologies. A discussion of these technology options and requirements are quite extensive and beyond the scope of this volume. There are some good references cited at the end of this chapter where you can gain valuable information from. Table 4. Estimated Economics for Incineration. The design cost will be a function of the incinerator cost plus installation which is normally in the range of 4 to7%. This cost should be doubled to include engineering services during project construction. It should be noted that with the electric furnace, the power needed to start up results in a large connected load. In areas of the country where there are high demand charges for electric power, this system can be economically impractical. High-temperature processes have been used for the incineration or combustion of municipal wastewater solids since the early 1900s. Popularity of these processes has fluctuated greatly since their adoption from industrial combustion. Thirty years ago, combustion of wastewater solids was both practical and inexpensive. Solids were easily dewatered and the fuel required for combustion was cheap and plentiful. In addition, air-emission standards were virtually nonexistent. Today, wastewater solids are more complex and include sludge from secondary and advanced waste treatment processes. These sludge are more difficult to dewater and thereby increase fuel requirements for combustion. Due to environmental concerns with air quality and the energy crisis, the use of high-temperature processes for combustion of municipal solids is being scrutinized. More efficient solids dewatering processes and advances in combustion technology have renewed an interest in the use of high-temperature processes for specific applications. • Maximum volume reduction. Reduces volume and weight of wet sludge cake by approximately 95 percent, thereby reducing disposal requirements. • Energy recovery. Potentially recovers energy through the combustion of waste products, thereby reducing the overall expenditure of energy. • Cost. Both capital and operation and maintenance costs, including costs for supplemental fuel, are generally higher than for other disposal alternatives. • Operating problems. High-temperature operations create high maintenance requirements and can reduce equipment reliability. • Staffings. Highly skilled and experienced operators are required for high-temperature processes. Municipal salaries and operator status may have to be raised in many locations to attract the proper personnel. A value commonly used in sludge incineration calculations is 10,000 Btu per pound of combustibles. It is important to clearly understand the meaning of combustibles. For combustion processes, solid fuels are analyzed for volatile solids and total combustibles. The difference between the two measurements is the fixed carbon. Volatile solids are determined by heating the fuel in the absence of air. Total combustibles are determined by ignition at 1,336° F (725° C). The difference in weight loss is the fixed carbon. In the volatile-solids determination used in sanitary engineering, sludge is heated in the presence of air at 1,021° F (550° C). This measurement is higher than the volatile-solids measurement for fuels and includes the fixed carbon. Numerically, it is nearly the same as the combustible measurement. If volatile solids are used in the sense of the fuels engineer, it will be followed parenthetically by the designation/wefe usage. If the term volatile solids or volatiles is used without designation, it will indicate sanitary engineering usage and will be used synonymously with combustibles. The amount of heat released from a given sludge is a function of the amounts and types of combustible elements present. COMBUSTIBLE ELf Hi NTS. («ftTS. A5H (RELATIVtLY INERT) (Al INCíNEHATtON COMPLETE COMBUSTION! Figure 27. Basic elements of high temperature processes. The primary combustible elements in sludge and in most available supplemental fuels are fixed carbon, hydrogen, and sulfur. Because free sulfur is rarely present in sewage sludge to any significant extent and because sulfur is being limited in fuels, the contributions of sulfur to the combustion reaction can be neglected in calculations without compromising accuracy. Similarly, the oxidation of metals contributes little to the heat balance and can be ignored. Solids with a high fraction of combustible material (for example, grease and scum) have high fuel values. Those which contain a large fraction of inert materials (for example, grit or chemical precipitates) have low fuel values. Chemical precipitates may also exert appreciable heat demands when undergoing high-temperature decomposition. This further reduces their effective fuel value. Table 5 provides a summary of typical chemical reactions that take place during combustion, along with heating values of the reactions. where C, H2, 02, and S represent the weight fraction of each element determined by ultimate analysis. This formula does not take into account endothermic chemical reactions that occur with chemically conditioned or physical-chemical sludge. The ultimate analysis is used principally for developing the material balance, from which a heat balance can be made. • Proximate analysis - a relatively low-cost analysis in which moisture content, volatile combustible matter, fixed carbon, and ash are determined. The fuel value of the sludge is calculated as the weighted average of the fuel values of its individual components. • Calorimetry - this is a direct method in which heating value is determined experimentally with a bomb calorimeter. Approximately 1 gram of material is burned in a sealed, submerged container. The heat of combustion is determined by noting the temperature rise of the water bath. Several samples must be taken and then composited to obtain a representative 1-gram sample. Several tests should be run, and the results must be interpreted by an experienced analyst. New bomb calorimeters can use samples up to 25 grams and this type of unit should be used where possible. 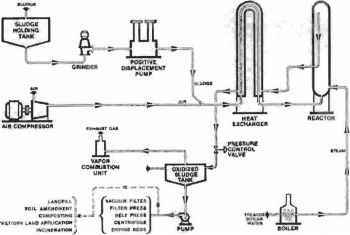 The preceding tests give approximate fuel values for sludge and allow the designer to proceed with calculations which simulate operations of an incinerator. 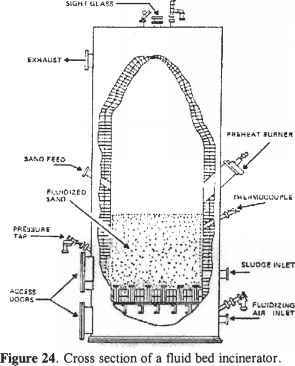 If a unique sludge will be processed, or unusual operating conditions will be used, pilot testing is advised. Many manufacturers have test furnaces especially suited for pilot testing. When the organic sludge is heated, heat causes water to escape from the sludge. Thermal treatment systems release water that is bound within the cell structure of the sludge and thereby improves the dewatering and thickening characteristics of the sludge. The oxidation process further reduces the sludge to ash by wet incineration (oxidation). Sludge is ground to a controlled particle size and pumped to a pressure of about 300 psi. 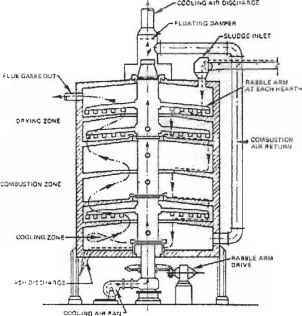 Compressed air is added to the sludge (wet air oxidation only), the mixture is brought to a temperature of about 350° F by heat exchange with treated sludge and direct steam injection, and then is processed (cooked) in the reactor at the desired temperature and pressure. The hot treated sludge is cooled by heat exchange with the incoming sludge. The treated sludge is settled from the supernatant before the dewatering step. Gases released at the separation step are passed through a catalytic after-burner at 650 to 705° F or deodorized by other means. In some cases these gases have been returned through the diffused air system in the aeration basins for deodorization. The same basic processes is used for wet air oxidation of sludge by operating at higher temperatures (450 to 640° F) and higher pressures (1200 to 1600 psig). The wet air oxidation (WAO) process is based on the fact that any substance capable of burning can be oxidized in the presence of water at temperatures between 250° F and 700° F. Wet air oxidation does not require preliminary dewatering or drying as required by conventional air combustion processes. However, the oxidized ash must be separated from the water by vacuum filtration, centrifugation, or some other solids separation technique. If Ha2 > > 1, the entire oxidation reaction occurs within the liquid film and when Ha2 < < 1, then most of the reaction occurs beyond the film, i.e. in the bulk liquid phase. In the latter case, the bulk liquid volume controls the rate with no benefit from an increase of the interfacial area. However, the Hatta number is a criterion which tells us whether the oxidation would occur in the bulk liquid-phase, therefore necessitating a large volume of liquid, or completely in the boundary layer, which calls for contacting devices that provide for a large interfacial area. In order to employ the principle of the Hatta number, in a system of complex reactions such as oxidation of organics in wastewater, a multidimensional space has to be reduced by lumping the species with similar reactivity. For kinetic analysis and design purposes, the species originally present in a wastewater or produced during the course of oxidation are conveniently divided at least into three lumps: (i) original compounds and relatively unstable intermediates, (ii) high molecular mass organic acids, and (iii) low molecular mass organic acids. As it has been shown for catalytic cracking, the lumped oxidation kinetics in many cases also obey the power-law form, with the exponent for a continuous-stirred tank reactor (CSTR) being lower than that for a plug-flow reactor (PFR) or a batch reactor (BR). It has been demonstrated that the kinetic behavior of a reactive mixture of organics in a batch system is governed by the most refractory lump, i.e. the lump of low molecular mass acids, while this is not the case with CSTR. Consequently, the lumped kinetics developed from BR data cannot be used for predicting TOC conversions in CSTR. (chemical oxygen demands of 10,000 to over 100,000 mg/Liter) or which contain components that are not readily biodegradable or are toxic to biological treatment systems. CWAO process plants also offer the advantage that they can be highly automated for unattended operation, have relatively small plant footprints, and are able to deal with variable effluent flow rates and compositions. The process is not cost-effective compared with other advanced oxidation processes or biological processes for lightly contaminated effluents (COD less than about 5,000 mg/Liter). The CWAO process is a development of the wet air oxidation (WAO) process. Organic and some inorganic contaminants are oxidized in the liquid phase by contacting the liquid with high pressure air at temperatures which are typically between 120° C and 310° C.
Wet Oxidation is the oxidation of soluble or suspended oxidizable components in an aqueous environment using oxygen (air) as the oxidizing agent. When air is used as the source of oxygen the process is referred to as wet air oxidation (WAO). The oxidation reactions occur at elevated temperatures and pressures. Figure 28. Process scheme for Wet Air Oxidation (WAO). Note that RCOOH denotes short chain organic acids such as acetic acid which make up the major fraction of residual oxidation intermediates in a typical wet oxidation effluent. Properties of wet oxidation liquid effluent include: negligible NOx and S02, negligible particulate matter, and some VOCs, depending on the waste. Wet oxidation is a mature technology with a long history of development and commercialization. Wet oxidation is applicable to numerous types of waste and is used commercially for the treatment of high strength industrial wastewater, ethylene and refinery spent caustic sludge. There are two other processes that we should mention that are used in conjunction with the WAO process. The first of these is thermal sludge conditioning/low pressure oxidation (LPO). Thermal sludge conditioning is used for the conditioning of biological sludge for dewatering. Thermal conditioning is accomplished using temperatues of 175 to 200° C (350 to 400° F). The low temperature allows for low operating pressures. Thermal conditioning is most commonly used for municipal wastewater treatment sludge. It has also been applied to industrial sludge processing. The technology is applicable to any organic sludge which is difficult to dewater or that contains pathogenic components. The LPO process heats sludge to a point where the biosolids break apart, releasing much of the water trapped within the cell structures, allowing filter presses, vacuum filters , belt presses and other dewatering technologies to perform their jobs more effectively. This process along with dewatering achieves a 90 to 95 % sludge volume reduction, while at the same time destroys any pathogens in the sludge. A schematic of the process is illustrated in Figure 29. The second process used in conjunction with WAO is wet air regeneration. This is a liquid phase reaction in water using dissolved oxygen to oxidize sorbed contaminants and biosolids in a spent carbon slurry, while simultaneously regenerating the powdered activated carbon. The regeneration is conducted at moderate temperatures of 400 to 500° F and at pressures from 700 to 1000 psig. The process converts organic contaminants to C02, water and biodegradable short chain organic acids; sorbed inorganic constituents such as heavy metals can be converted to stable, non-leaching forms that can be separated from the regenerated carbon. The technology can be more cost and energy efficient than incineration, and the regeneration is accomplished in a slurry without NO,, SO„ or particulate air emissions. Wet Oxidation (WO): The oxidation of oxidizable substances in water using the oxygen in air, pure or enriched oxygen, hydrogen peroxide, nitric acid or some other oxidizing agent as the source of the oxidant. The oxidation process is conducted at subcritical temperatures (<374°C). Wet Air Oxidation (WAO): Wet oxidation using air as the oxygen source. Supercritical Water Oxidation (SCWO): Wet oxidation occurring in supercritical water at temperatures greater than 374°C (705°F) and pressures greater than 221 bar (3204 psig). Hydrothermal Treatment Process: Processes which involve the use of hydrolysis or that use oxidation/reduction in an aqueous matrix at elevated temperatures. The sidebar discussion provides us with a summary of the overall scheme of wastewater treatment covered over the last several hundred pages. At the end of the day, what we are left with is ultimate sludge. If we choose incineration, we still have a solid waste left to deal with, ash. If we choose another route to sludge volume reduction, we still have a solid waste residue to deal with. There is no ultimate destruction of sludge, only ultimate sludge that we are left with. The final engineering solution we need to devise is how to ultimately handle this waste. It simply boils down to whether we select a so-called pollution prevention related technology or a final disposal option for the solid waste. In the remaining sections we will explore the options available to us. 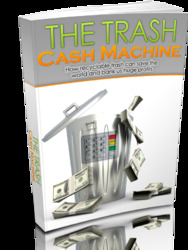 as a resource that can be recycled or reused. That concept embodies the spirit of pollution prevention. disposal in water, and disposal on land. A - Addition of Additives discussing the specific options in detail, let's first take a look at the big picture for each option. Disposal in water is one option to consider. This is an economical but not common method because it is contingent on the availability of bodies of water adequate to permit it. At some seacoast cities, sludge either raw or digested is pumped to barges and carried to sea (the context of these discussions is strictly sewage) to be dumped in deep water far enough off shore to provide huge dilution factors and prevent any ill effects along shore. In the past few years there has been an increased problem of pollutional loads, well above safe standards, affecting the south-shore beaches on Long Island, facilitating the closing of the beaches to the public. Some of these pollutional loads have been attributed to sludge deposits coming to shore form offshore sludge barging operations. Where barged to sea, the value of some treatment such as thickening or digestion, depends on the relative cost of the treatment and savings in cost by barging smaller volumes, or the value of gas produced by digestion. Overall, this is an environmentally unfriendly option, and the bottom line is that it is no different that straight landfill, and in fact can be more environmentally damaging. It is plain and simple, an end-of-pipe solution with trad-offs. When we used drying bed and lagoon?